Eastern Edge Gallery, in partnership with The Rooms, is proud to present the first Artist in an Indigenous Artist-in-Residence Program – Nelson White. Nelson’s work is currently being exhibited on the fourth floor of the Museum section of the Rooms, which allows for critical dialogue between the themes of identity in both White’s work and the Museum. Nelson White is an artist and illustrator who is a member of the Flat First Nation Band (No’kmaq Village) in Flat Bay, Newfoundland. His father is a respected elder who was recently awarded the Order of Canada for his lifetime of lobbying for the rights of Mi’kmaq people. White attended the Visual Arts program at the former Bay St. George Community College and later at the Nova Scotia College of Art and Design. After a brief career in advertising, White had a long career in administration both in professional sports and later in the non-profit sector. 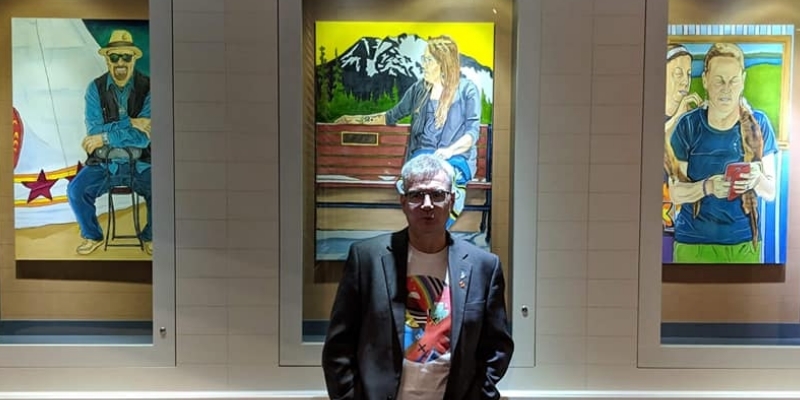 Over the last number of years, he has become a working artist with his pieces exhibited frequently throughout Canada and the United Stated in both group and solo shows. White currently lives in St. John’s, NL, with his family and pets.